Borchert Field: "Time Was... 1948"
For the 1998 season, Major League Baseball expanded by two clubs, adding the Arizona Diamondbacks to the National League and the Tampa Bay Devil Rays to the American League. This resulted in two leagues of 15 teams apiece, and in order to avoid everyday interleague play one team had to move from the AL to the NL. The Kansas City Royals were offered first crack at the Senior Circuit, but preferred to stay in the American League, and the choice then fell to the second team. On November 6, 1997, the Milwaukee Brewers chose to jump to the National League. I clearly remember the moment I learned about the switch. We knew the decision was forthcoming, and were pretty sure that what it would be, but it wasn't until I picked up a copy of the Milwaukee Journal Sentinel from a box on the northeast corner of Kilbourn and Water that I knew for sure. 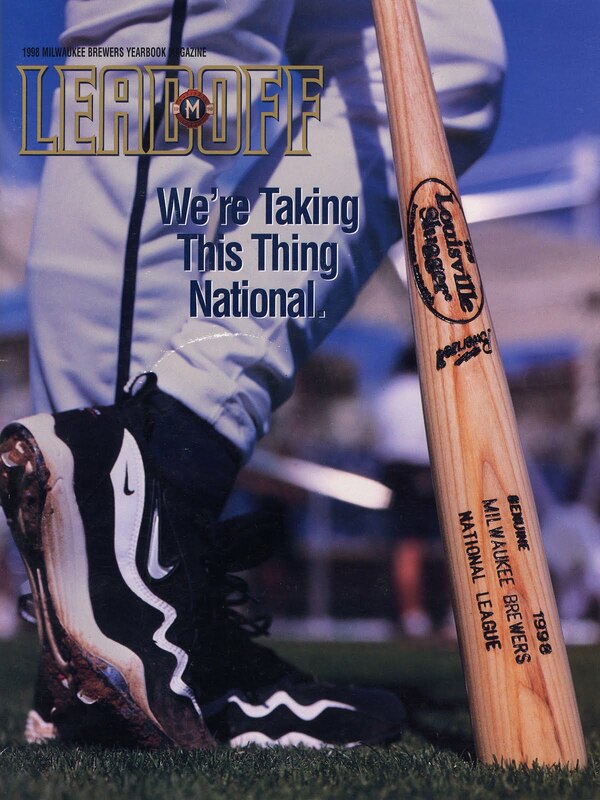 The Brewers made the most of the event with their 1998 ad campaign, "We're Taking This Thing National." In Milwaukee, this news was greeted with a mixture of sadness and enthusiasm. Hundreds of thousands of Wisconsin baseball fans had grown up with an American League team, fed on rivalries with the Yankees, Royals and Twins. But the generation before theirs was raised on the Milwaukee Braves, and the Cream City's glorious National League past. Few seemed to remember anything farther back than 1953. That was going to change, though. These pages are from Volume 7, Number 1 of Lead Off, the official magazine of the Milwaukee Brewers (then a relatively new name which could never live up to its predecessor What's Brewing). 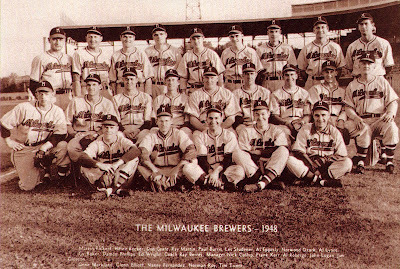 Lead Off ran a five-part look at Milwaukee's baseball history entitled "Time Was", with a look at the Brewers in 1988 and 1978, the White Sox in 1968, the Braves in 1958... and our Brewers in 1948. 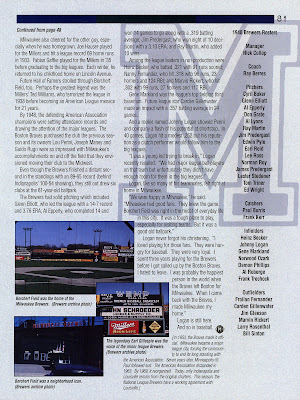 The article is © 1998 Milwaukee Brewers. I reprint it here for its historical value. Keep in mind that in 1998, this may have been many fans' first introduction to the American Association club. One has to admire the kinship that existed between eight cities during the first half of this century. A genuine bloodline of mid-American values, they withstood European migration, the Great Depression, Prohibition, two World Ward and the nation's industrial boom. For 50 years, they grew with the country but refused to leave the family. Their family. They were known as the Millers of Minneapolis, the Saints of St. Paul, the Blues of Kansas City, the Mud Hens of Toledo, the Colonels of Louisville, the Red Birds of Columbus, the Indians of Indianapolis and the Brewers of Milwaukee. For 50 years, they resided in the American Association which held the distinction as the only minor league baseball circuit that numbered all its charter members. And the communities they called home embraced them like a child in a parent's arms. In Milwaukee, this love affair played out in the heart of the city. The team even rooted itself in a quaint neighborhood. Old Atletic Park, which opened in 1887 at the corner of Eighth and Chambers, melded into the daily life of its surroundings. Baseball became part of the city's social and economic fabric. Progress came when cobblestone lanes and streetcars replaced dusty roads and horse drawn buggies. 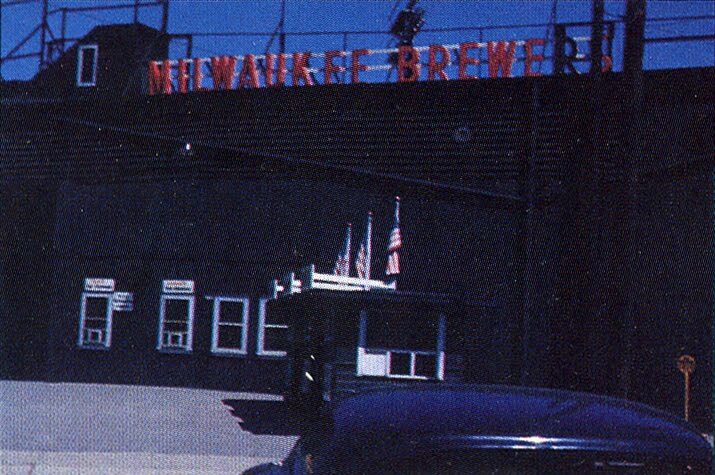 By 1927, Brewers owner Otto Borchert gave the ballpark an identity. To bond with the public, live pigs, beer, cases of food and wartime ration stamps were given away to patrons. Fireworks displays and wedding ceremonies at home plate were the norm. Even morning games were played to accomodate wartime swing shift workers. Fans watched games for free through knotholes in the Burleigh Street fence and from second story porches on homes located on Seventh Street. During the winter, the manicured outfield turned into an ice skating rink. This was baseball in Milwaukee. It was successful. 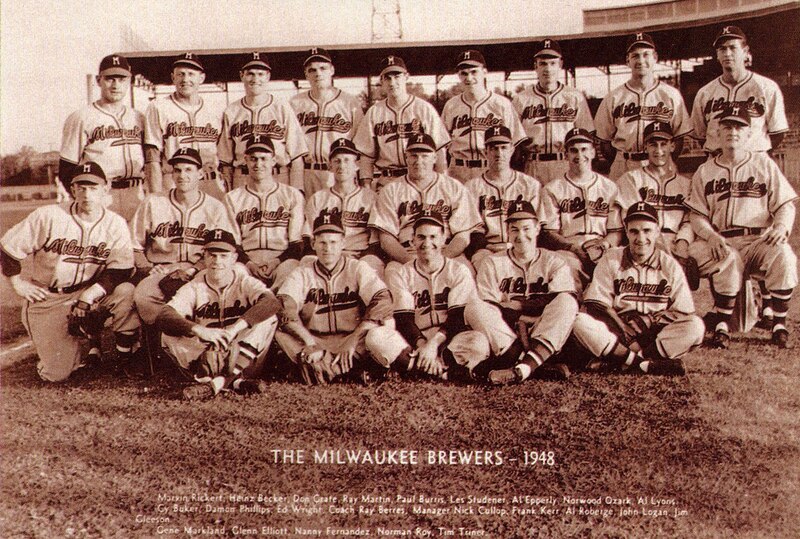 The Brewers made the playoffs nine times, winning the American Association championship in 1913, 1914, 1936, 1947 and 1951. Milwaukee had plenty of record setters including George Stone, who batted .405 in 1904 and Eddie Marshall, who hit safely in 43 straight games in 1935. Milwaukee also cheered for the other guy, especially when he was homegrown. Joe Hauser played for the Millers and hit a league record 69 home runs in 1933. Fabian Gaffke played for the Millers in '35 before graduating to the big leagues. Each winter, he returned to his childhood home on Lincoln Avenue. Future Hall of Famers strolled through Borchert Field, too. Perhaps the greatest legend was the Millers' Ted Williams, who terrorized the league in 1938 before becoming an American League menace for 21 years. By 1948, the defending American Association champions were setting attendance records and drawing the attention of the major leagues. 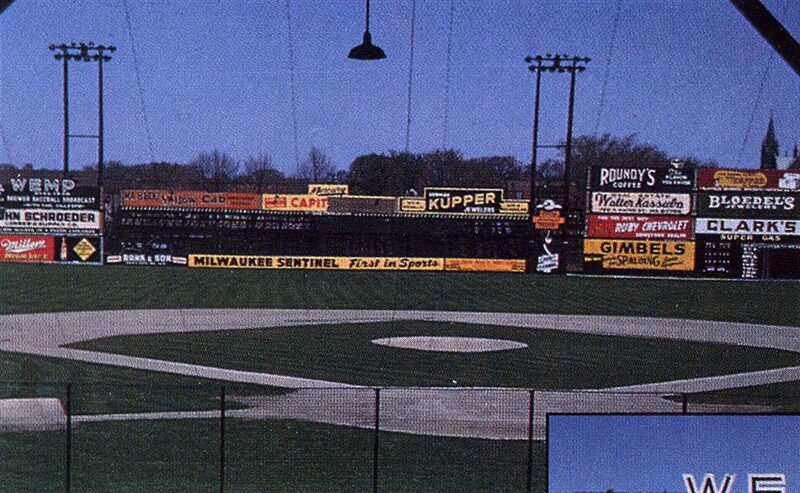 The Boston Braves purchased the club the previous season and its owners Lou Perini, Joseph Maney and Guido Rugo were so impressed with Milwaukee's accomplishments on and off the field that they envisioned moving their club to the Midwest. Even though the Brewers finished a distant second in the standings with an 89-65 record (behind Indianapolis' 100-54 showing), they still out-drew six clubs at the 61-year-old ballpark. 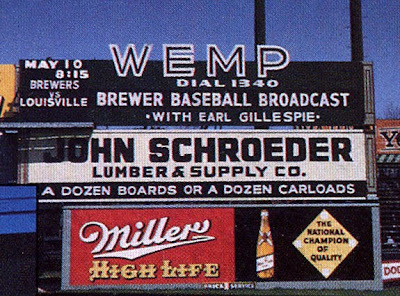 The Brewers had solid pitching which included Glenn Elliott, who led the league with a 14-7 record and 3.76 ERA; Al Epperly, who completed 14 and won 14 games to go along with a .319 batting average; Jim Pendergast, who won eight of 10 decisions with a .310 ERA; and Ray Martin, who added 10 wins. Among the league leaders in run production were Heinz Becker, who batted .321 with 91 runs scored; Nanny Fernandez, who hit .318 with 96 runs, 23 homers and 124 RBI; and Marvin Rickert, who hit .302 with 99 runs, 27 homers and 117 RBI. Gene Markand was the league's top fielding third baseman. Future league star Carden Gillenwater made an impact with a .357 batting average in 24 games. And a rookie named Johnny Logan showed Perini and company a flash of his potential at shortstop. In 40 games, Logan hit a modest .252 but his reputation as a clutch performer would follow him to the big leagues. "I was a young kid trying to break in," Logan recently recalled. "We had major league players on that team but unfortunately they didn't have enough room for them in the big leagues." Logan, like so many of his teammates, felt right at home in Milwaukee. "We were happy in Milwaukee," he said. "Milwaukee had good fans. They knew the game. Borchert Field was right in the midst of everyday life in this city. It was a tough place to play, especially for visiting teams. But it was a good old ballpark." Logan never forgot his christening. "I loved playing for those fans. They were hungry for baseball. They were very loyal. I spent three years playing for the Brewers before I called called up by the Boston Braves. I hated to leave. I was probably the happiest person in the world when the Braves left Boston for Milwaukee. When I came back with the Braves, I made Milwaukee my home." Logan is still here. And so is baseball. The Brews actually won nine American Association pennants, not five. They took home the flag in 1913, 1914, 1936, 1943, 1944, 1945, 1951 and 1952. His list of "1913, 1914, 1936, 1947 and 1951" refers to the times the Brewers won the Little World Series, not the American Association. After the season, the top four AA clubs met in a two-round playoff to decide who would go to the Little World Series. It's a little confusing to us today, since at the time it was possible to win the American Association flag and then get swept out of the playoffs. By 1998, Johnny Logan had already become the face of the American Association Brewers in Milwaukee. He continues to represent the Brews at events today, such as the dedication of the Borchert Field historical marker in 2008. Ziino details many of the innovations Bill Veeck brought to the Brewers — the giveaways, the morning games, the carnival atmosphere — without actually mentioning the man by name. Always love a reference to the Orchard's winter moonlighting gig as an ice skating park. The art accompanying the article is magnificent; I don't think I've seen any of these photos before. This team photo showcases the team's road uniforms, styled to resemble those of the parent Boston Braves. Note the navy cap with red bill and white block "M", which would soon be instantly recognizable to baseball fans all across the country. We also get three outstanding pictures of the Orchard. Lots of great Milwaukee companies represented here. The Milwaukee Sentinel, "First in Sports." Gimbels. Rank & Son Buick. Herman Kupper Jewelers, which went out of business in 1982. 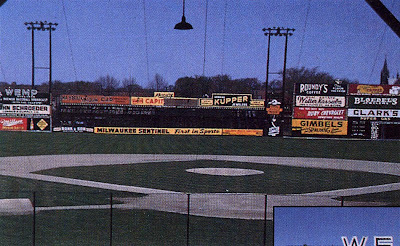 Clark's Super Gas sponsored the Brewers' game programs for over a decade, not to mention a minor league hockey team in Milwaukee from 1948-50. And, of course, Miller High Life. In the left field corner (far left of the above photo), this great ad for WEMP. The legendary Earl Gillespie was the voice of the minor league Brewers. The Gillespie ad helps us narrow down the date the photo, He was the voice of the Brewers for the team's (and ballpark's) final two years, 1951 and 1952. We can conclusively date it by the ad for an upcoming game — according to our 1951 pocket schedule tells us that on May 10, 1951 the Brewers hosted the Toledo Mud Hens. The 1952 schedule is more helpful. The Louisville game was May 10, 1952, so the photo must have been taken sometime just before that date. We might even be able to narrow it down further; May 10 was a homecoming game following a 15-game road trip. The previous home game was a doubleheader against the St. Paul Saints on April 20th, so the sign was presumably erected on that day. 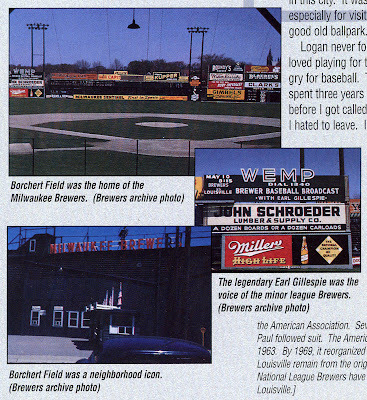 Borchert Field was a neighborhood icon. There are the cutout letters bearing the team name over the entrance at 8th & Chambers. 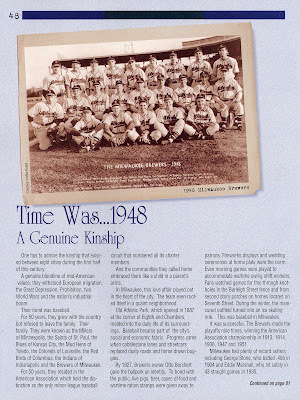 All in all, a fantastic look at the Brewers of the 1940s, seen through the perspective of the Brewers of the 1990s. The club used the occasion of a great step forward to take a look back into Milwaukee's long and colorful baseball history.